"5 Days of War" is burdened with too many nick-of-time rescues and a preposterously unlikely ending. Still, the movie is notable for its agonizingly authentic war-is-hell look, and for drawing attention to the savagery of a very recent conflict that most of the world already has forgotten. In August 2008, Russian troops and hired mercenaries invaded the former Soviet republic of Georgia, ostensibly to protect citizens of two Georgian provinces seeking independence. While the decidedly pro-Georgia film acknowledges differences of opinion about the cause of the conflict and who shot first, there is no disputing the short war’s devastating impact on tens of thousands of Georgian civilians. Anders’ involvement in the story that he is there to cover becomes personal when he and Ganz rescue a gorgeous Georgian schoolteacher named Tatia (Emmanuelle Chriqui, bearing a striking resemblance to the bangs-era Demi Moore). Attempting to reunite Tatia with her family, they witness scenes of torture, mass murder and shocking destruction on an epic scale. The Russian attacks are so overwhelming and convincing that the movie is rated R for “strong bloody war violence and atrocities.” In addition to choreographing some of the most large-scale and grittily realistic action set-pieces since Steven Spielberg’s "Saving Private Ryan," director Renny Harlin keeps the tension level high as Anders and company desperately try to get news about Russian war crimes to an indifferent world that’s more interested in the Beijing Olympics. 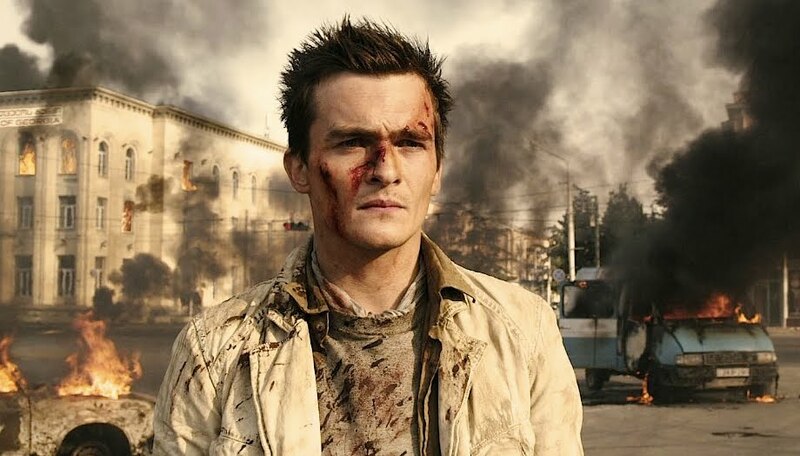 Despite some popcorn-sensibility plot problems, including a climax that’s so outrageously unlikely it should have been a character’s fantasy, "5 Days of War" gets message-movie points for showing the collateral damage caused by even such a short modern-warfare conflict. The film ends with short but moving testimonials from several real-life relatives of the war’s victims.